Roberta Isleib is a clinical psychologist who is all about killing–and I mean that in the nicest way. That’s because Isleib has also been enjoying a run of success as a mystery novelist, when not tending to the mental woes and cares of her regular clientele. We first “met” when Isleib began a five-novel mystery series starring Cassandra Burdette, a struggling young LPGA pro. I reviewed these books in this column when they first appeared, from 2002 through 2006. In addition to her problems out on the course, Cassie Burdette has a way of running into dead bodies at inconvenient times–as if there is a convenient time for that to happen. For example, in Buried Lie, a member of Burdette’s amateur foursome shows up dead shortly after the Shop-Rite pro-am outside Atlantic City. In Final Fore, the last book in the series, a promising young pro dies during an event at Mount Holyoke College. Isleib now spends much of her year in and around Key West, FL, where golf options are far more limited than when she lived in the Northeast. On the other hand, the usually sunny southernmost part of the continental U.S. has a good reputation for food. Using plenty of locale references throughout her new series, Isleib is now five books into a new mystery series, using the nom de plume Lucy Burdette as the narrator. Lucy is no golfer, but she is a food writer, and keeps semi-busy doing restaurant reviews and features for a small Key West newspaper. Naturally, dead people have a way of showing up in Lucy’s life–much like her cousin Cassandra, the LPGA pro, coincidentally. In the newest mystery, Death With All the Trimmings, (Penguin; $7.99 SRP), Cassandra makes an appearance or two, and has a minor role in the central mystery of the untimely demise of a popular New York City chef, down to the Keys to see his ex-wife. 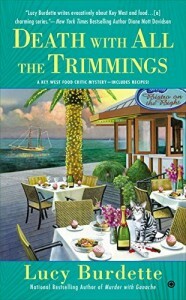 As with her first series, Iselib liberally doses her books with plenty of local Key West color, which should be very familiar to Cape Region snowbirds who trek there each winter. There’s also plenty of family drama, business hi-jinks at the paper, and other distractions to finding out who’s behind the latest murder. If Isleib’s not careful, she may make Key West as figuratively unsafe as tiny Cabot Cove, scene of Angela Lansbury’s “Murder She Wrote” TV series. These are fun little mysteries, just like Isleib’s original Cassandra novels. And there are recipes, too.